Everyone needs a go-to dessert when entertaining. This indulgent, make-ahead Vanilla Bean Panna Cotta recipe is mine. Pat and I went to Italy to celebrate a milestone wedding anniversary a few years ago. It was the best vacation we’ve ever taken, not just for the amazing scenery and quality time together, but – naturally -because of the FOOD! This recipe for Vanilla Bean Panna Cotta is the closest thing I’ve found to reliving our time there. It’s THAT good. Fortunately, I don’t have to wait for another trip to Italy to enjoy panna cotta. 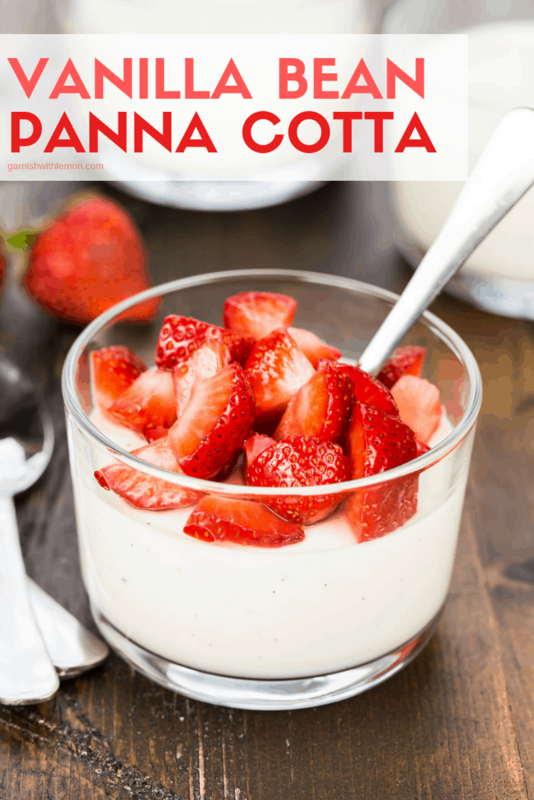 This Vanilla Bean Panna Cotta recipe makes a super easy, luxurious-tasting dessert that is equally at home on a weeknight or for company. The most complicated part is scraping the seeds from the vanilla bean, but trust me, it’s completely worth the extra effort for that deep, rich vanilla flavor. What is panna cotta made of? This traditional Italian dessert actually translates to “cooked cream” in Italian. In this recipe, you heat heavy cream and sugar and infuse it with the flavor-packed seeds of a vanilla bean. Then you stir in gelatin and milk. The extra special ingredient here is whole milk Greek yogurt. It adds just a hint of tartness to this sweet, indulgent recipe. What toppings should I add to my panna cotta? The sky is the limit here! Ripe, ruby red strawberries are my go-to topping. They pair so beautifully with the vanilla bean flavor of the panna cotta. But really, any berry will work. If you’re feeling particularly indulgent, you can also top them with a drizzle of caramel or hot fudge. Or simply keep them plain. They are definitely rich enough to stand on their own without any additional adornment. Panna Cotta is a great make-ahead dessert for parties. Short on time and need to prep ahead? 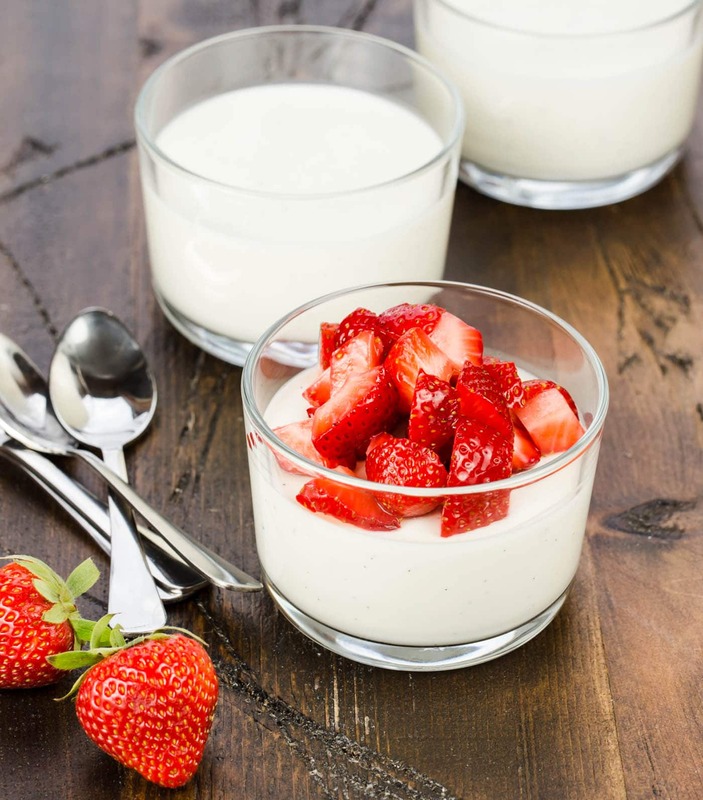 This Vanilla Bean Panna Cotta recipe is great for time-strapped hosts! You can make this dessert up to three days ahead of time. Simply cover and keep in the fridge until party time. This Vanilla Bean Panna Cotta is also tailor-made for your dessert buffet. Typically not everyone is hungry for dessert at once, so I love to set out a tray of panna cotta along with a variety of toppings for guests to add whenever they are ready to indulge. It’s a win-win for everyone! Until I can make a return trip to Italy, you’ll find me here reliving my memories one mouthful of Vanilla Bean Panna Cotta at a time! 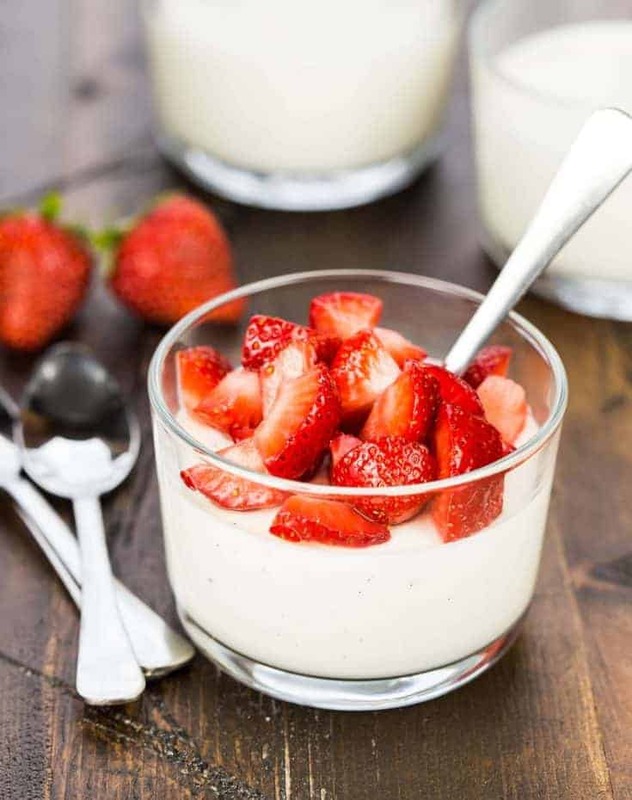 Vanilla Bean Panna Cotta is a simple but classy make ahead dessert that is perfect for parties. Set up a variety of toppings and let your guests serve themselves! Pour the cream into a medium saucepan. Using the sharp tip of a paring knife, cut the vanilla bean in half lengthwise. Open up the bean and flatten out the halves. Scrape out the seeds with the back of the knife blade and add the seeds and vanilla bean to the saucepan. Stir in the sugar. Bring the cream mixture to a simmer over medium-low heat, whisking occasionally. Remove the vanilla bean from the cream and discard. Meanwhile, pour the milk into a bowl and sprinkle the gelatin over the top. Let stand about 5 minutes and then mix the milk into the hot cream. Add in the yogurt and stir until smooth. Pour mixture into ramekins, cover with plastic wrap and refrigerate at least 6 hours or overnight. Yum! I remember when you made this treat for our family! This one is a keeper! Thanks, Donelle! It’s one of our favorites, too. These are beautiful! And they sound amazing too! Thanks, Ai. They are a family favorite. Is it right the recipe calls for 1 1/2 teaspoon gelatin? Or do you mean tablespoon? I just made a batch and it’s thick but not set…it’s been four or more hours since I refrigerated it. Hi Liz, I’ve made this recipe numerous times with the 1 1/2 teaspoons gelatin, and it’s worked perfectly every time. Did you use the heavy cream and whole milk Greek yogurt? Hi Anna, yes I did… I actually used whole milk instead of 1percent. It set a little this morning when I checked though it’s more on a softer side. But it is really delicious. I think I’m accustomed to more firmer panna cota. I really appreciate your speedy reply! Great to hear, Liz. Enjoy! Hi, I love this recipe and so does everyone I’ve made it for. Was wondering if I can add puréed strained strawberries to the cream and vanilla to make a strawberry version or where would I need to add the strawberries? Hi Sandi, so glad you love the panna cotta! I’ve never incorporated strawberries directly into the mixture, but it sounds heavenly. My only thought is that you MIGHT have to increase the gelatin just a bit to get it to set correctly since you’re adding more “liquid” (strawberries) to the mixture. But I wouldn’t think you’d need much more, if any. Please give it a go and let me know how it turns out!